How is Applied Physics different from the traditional bachelor's degree program in physics? The B.S. degree in Physics has two programs as listed in the Undergraduate Academic Bulletin: Program I: Physics and Program II: Applied Physics. In order to prepare students for industrial and laboratory jobs directly after completion of their bachelor's degree, the Applied Physics program substitutes a more rigorous laboratory program and coursework in the applied aspects of physics for some of the traditional upper-level, theoretical courses. The centerpiece of the Applied Physics program is two three-month internships in a corporate or national laboratory setting. Who typically enrolls in Applied Physics? Students who are interested in pursuing high-tech jobs immediately after graduation are excellent candidates for the Applied Physics program. Those students wishing to continue their physics studies in graduate school are encouraged to take traditional Physics program. Is it true that I should not select the Applied Physics program if I plan to continue on to graduate school? Absolutely not! The formalized thesis and internship requirements will likely make you a better candidate for graduate school. You should consult with your advisor and be sure to take the necessary senior elective courses, for example, Quantum Mechanics, that are needed to be successful in a graduate program. If I enroll in the Applied Physics program, will I receive a B.S. in Applied Physics? No, students in both programs, Physics (traditional) and Applied Physics, receive a B.S. in Physics. What is the typical starting salary for students with a bachelor's degree in physics? 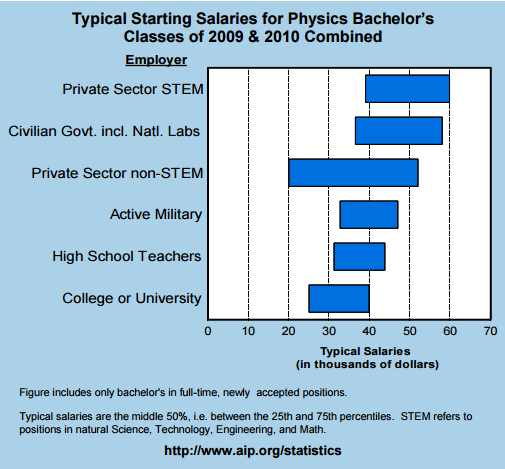 The figure on the right shows the typical starting salary for Physics bachelor's degree recipients in 2006 and 2007. The data were obtained from American Institute of Physics statistics database. The most likely employers for graduates of the Applied Physics program would be Private Sector Science and Engineering jobs and Civilian Government jobs. Will I receive help with finding a job upon graduation? Yes, the IU Career Development Center and Arts and Sciences Career Services is available to help in all aspects of the job search, application, and interview process. How can I become part of the rapidly growing Indiana biomedical sciences industry? The Kelly School of Business CBLS Student Associate program is an excellent way to become involved with businesses needing physicists and engineers while you are still an undergraduate in Physics. I am a high school teacher, and I would like to have someone from the Indiana University Physics Department come talk to my class about current research and careers in physics. How do I arrange this?